Get 'em while their hot! Re: FM's got some 2.5" Deep "Turbo Heads"
Got mine today! Fits my Torch perfect and gives it some throw now. My original torch reflector was smaller than the bulb. This works great with just a small gap around the bulb. Not the prettiest with dark gray on a silver host but happy with it all the same. btw: Both of mine have a nice 1/2" circle of dust in the inside center of the lens. One may go back to FM because of a small shark fin shaped nick in the reflector surface. I'm all about the bright lights! Bezel on my two were on so tight I had to use opposing strap wrenches to remove them-had to clean lenses. I was able to get one off by hand. The other is nicked and wouldn't budge so I'll probably just sent back for FM to deal with. It's almost dark so I can give it a good test. My excitement is building! Mine arrived today and it looks perfect. It might fit on the frog green M@g85 but the combination of a red-eyed tree frog and White's green frog is not appealing. Any suggestions from the hotwire experienced crowd? To what are you folks attaching it? This is another very nice FM development. The red looks the nicest. The gray has a slight color HA mismatch between the two sections shown. This gives very nice focus for hotspot and throw....slightly outperforming the 2" Deep. There are two downsides, namely you can see with the red 1D that I made into a Mag85 how it screws onto the existing reflector base...in other words it replaces the inside reflector, and top bezel...which adds quite a length to the light...but it has a nice artistic curve shape, so helps. The other downside compared to the 2" is this one has ONLY a 1/2" bulb bore, so for WA bulbs that is not ideal. What this is REALLY OUTSTANDING with is the 75-100 Osram bulbs. This includes the MaxBlaster, Torch, DeathBlaster, etc. It gives outstanding hotspots with those lights, and eliminates the need for those heavily stippled reflectors they come with. BTW, I'm using AW's new 3 x 17670-P cells after changing the battery holder to 3s that sold in this latest 1D sale to have a 1D Mag85. It works perfectly with FM's stock spring, switch, gold bipin bulb holder...without any spring or other resistance mods. I may put the old 2" Deep reflector on this to shorten it, do the tailcap spring mod, and use one of the 4 AWR Hot Drivers I have on this for better regulation. LL, very nice collection. Wow, I've never seen so many beautifully made and incredibly bright lights in one place before. I was on FM's list for a red light, but passed on the larger reflector as I'm just too new to the hobby yet. Mine is so small and so bright it's just a perfect night walk companion. It's a good feeling to be able to turn my bit of night into day in a moment. I've been a bit concerned about scratching my FM1D but I suppose it will eventually happen. 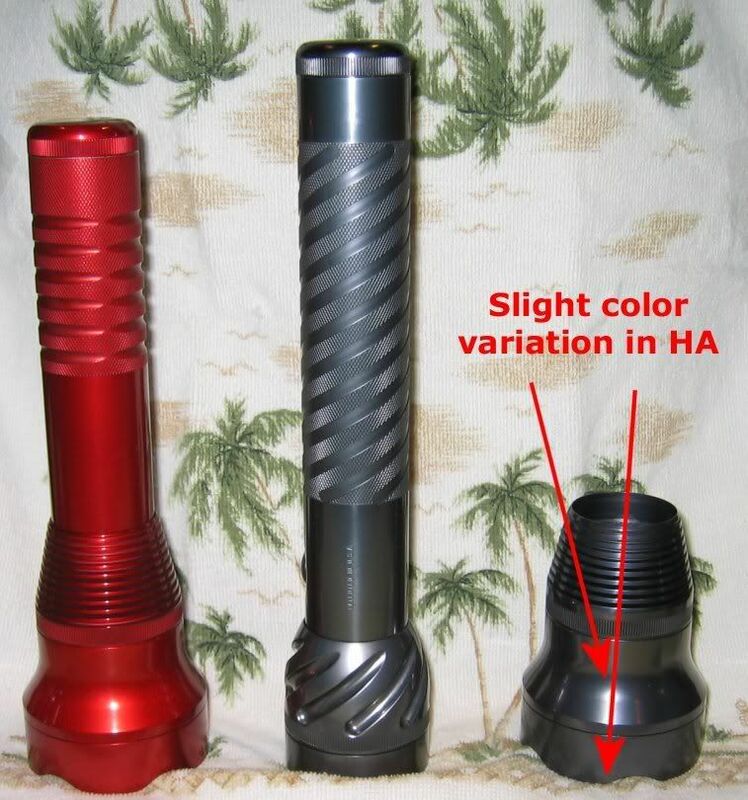 Do you have a favorite carry light? Welcome to FF's and the Flashlight hobby in general! I would say my general preference is the 1D or 1.5D size lights just because of their portability when going for longer walks. But rarely do I grab the same light every night. I like to see the various characteristics of all the lights. Like last night I was watering my grass after the sun went down, and was using a 2D size which has a longer run time. There are so many combinations of color, look, shape, size of the light....then type and size of reflector which gives a whole other set of characteristics....then there's the issues of types of batteries, bulbs, filament shape, bulb color....it's a mixture of many facets that gives a variety to choose from. If I could ONLY have one light, I would pick the brightest, longest running in a 1 or 1.5-D size...but I have about 12 of them...so I'm still back to not being able to choose.